There is nothing as comforting as a slice of fresh warm bread. 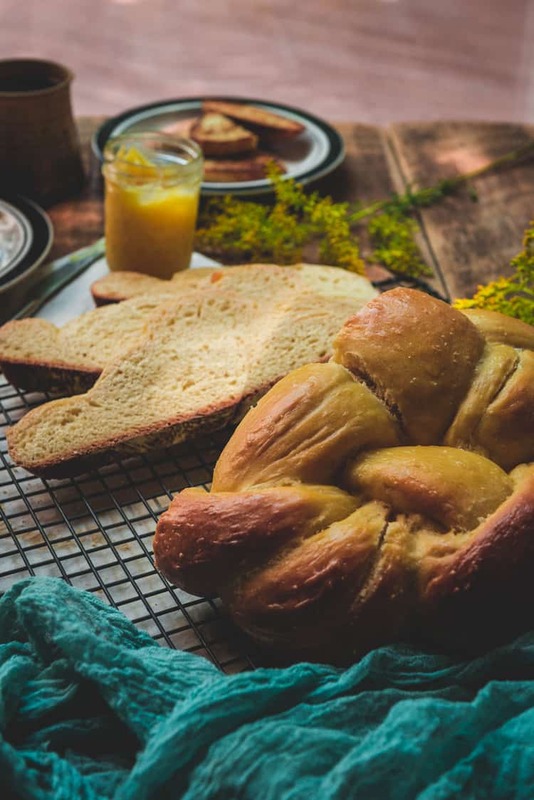 This homemade challah bread recipe walks you through a classic, step by step, and is perfect for a weekend brunch. It starts with the warm hue of dappled sunlight tricking through the maple leaves on a warm summer day. The kitchen sits empty and inviting as a breeze brushes just the edges of your shirt sleeves and reminds you that the seasons are sliding from one to the next. That the long days of sun are quickly sinking to the shorter cooler nights and the leaves that shade this spot will flee all too soon. Its the perfect morning to sit and dust a counter with flour. To knead bread and be patient through the process. And so, the challah starts. The clock ticks on as the shadows dance with the shift in the sun. The flour and eggs and mixed and the dough is set to rise. The mid-morning light dancing softly across the counters, flickering off vases and jars sending a spectrum of color through the room. The dough is pressed and rises again. The quiet dappled light, in its silent defiance of the earth’s rotation, seems to become more radiant as we move towards dusk in this slow and patient process. Today is not for my own schedule, but for that of the dough, the yeast, and the process of letting bread form. The homemade challah dough is rolled and braided. The oven fills the afternoon kitchen with extra heat as it warms readying itself to finish the process. The challah bakes, turning to a smooth golden loaf with perfect seams weaving in through each other. 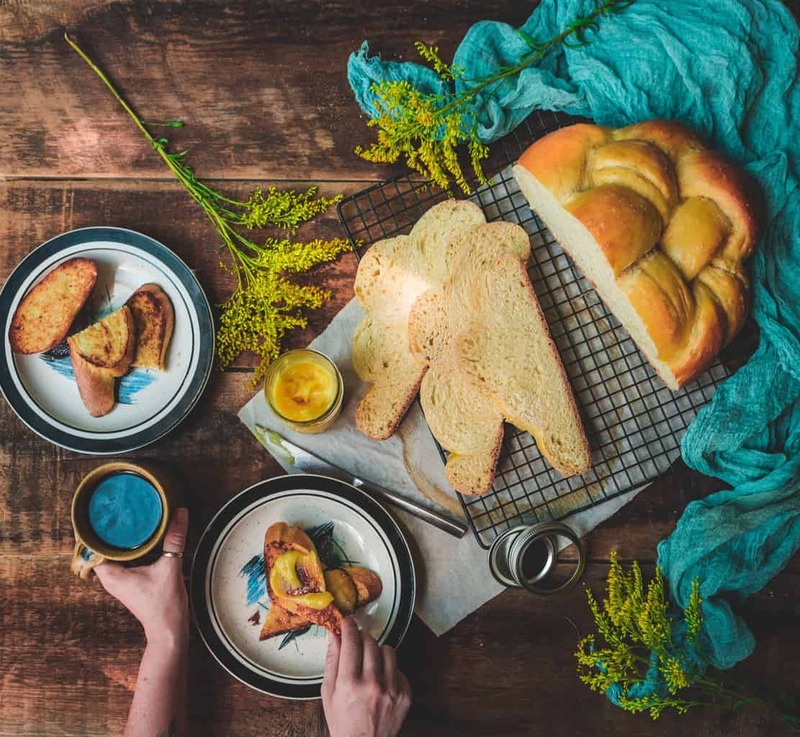 In the morning, our patience is rewarded as we slice the challah, discovering perfect air pockets, a buttery texture, and the rich flavor that only rich egg-based breads can have. 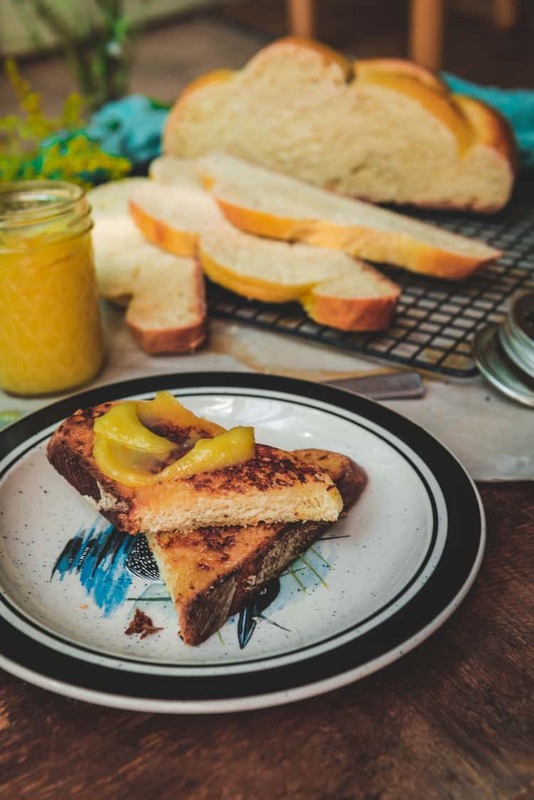 We smooth homemade lemon-lime curd atop and enjoy the bread, lightly fried. That half slice, worth the wait and patience of the day before, forced to slow down, spent watching the light dance across my kitchen floor. This Challah is amazing. Thick, hearty, and delicious. It also makes a killer french toast ;). If you’ve tried this Homemade Challah Bread recipe or any other recipe on passthesushi.com please don’t forget to rate the recipe and let me know where you found it in the comments below. I love hearing from you! You can also follow along for more good eats and travel tips on Instagram @passthesushi & @girlcarnivore, Twitter & Facebook. In a small bowl, whisk together yeast and water. Allow the yeast to bloom in warm water for 5 minutes. 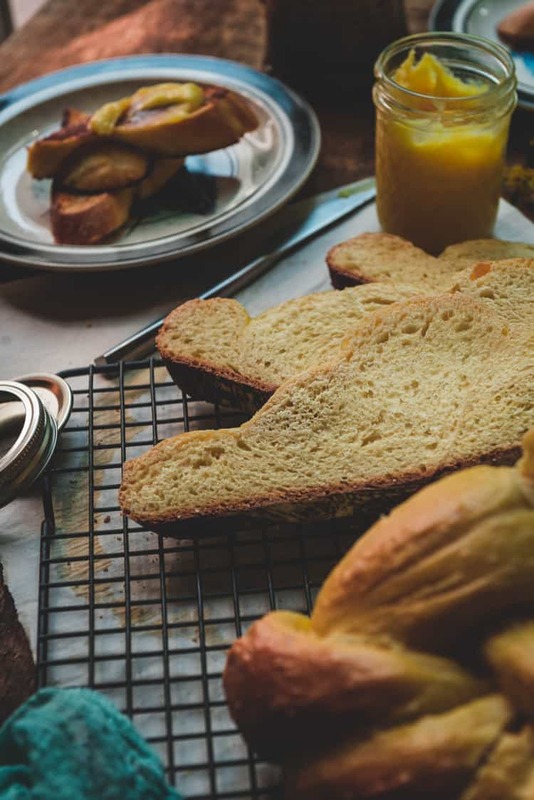 In the bowl of your stand mixer, fitted with the hook attachment, whisk together the flour, yeast mixture, honey, and eggs until smooth and no clumps remain. Cover the bowl with plastic wrap and place in a warm dry area (I use the inside of my oven). Let the starter stand 2 to 12 hours, until ready to make the challah. In a large clean bowl, whisk together flour and yeast. Once combined, add in the salt. Gently, sprinkle the flour mixture over the top of the sponge and cover with plastic wrap. Allow the mixture to stand 1 to 4 hours. In a the bowl of your stand mixer, combine the eggs, oil, honey, and apple cider vinegar until combined. Gently, add the flour mixture, and stir on low with the dough hook until well combined. Run the mixer for a few moments until the dough just starts to come together and peel back from the bowl. Fold the dough out on to a clean work surface, lightly dusted with flour, and knead until the dough comes together into a smooth ball, about4 to 6 minutes. Place a towel over the dough and let it rest for 20 minutes. Knead the dough again until the dough is very elastic. The dough will spring back a bit when pressed gently with your finger. The dough will be slightly tacky to the touch. Lightly coat a large with oil. Place dough in bowl, and turn it a bit to coat it in oil on all surfaces. Cover and place in a warm spot. Allow to rise until doubled, about one to two hours. Punch the dough down gently with your hands and reshape in the bowl. Toss it to coat in oil again and cover. Allow to double a second time, for about an hour longer. Turn dough out onto a lightly floured surface and flatten gently with your hands. With a dough scraper or knife, cut into three equal pieces and allow to rest 8-10 minutes. Working one at a time, roll each portion of dough into a long rope, about 15-18”, gently pulling and stretching as you go. Arrange the dough laying side by side and start a braid, weaving them in upon one another working from the center out to either side. Bring the two ends together, folding and tucking under itself. Transfer the the dough onto a baking sheet lined with parchment paper. Beat the remaining egg in a small bowl, and with a brush the challah, making sure to not allow any puddles to form in the creases. Bake 30-35 minutes, until the loaf is golden, or registers 190 degrees in the very center with your wireless thermometer. This recipe comes from The Bread Bible, by Rose Levy Beranbaum. Please grab a copy for a tomb of classic bread recipes. That sounds so yummy! 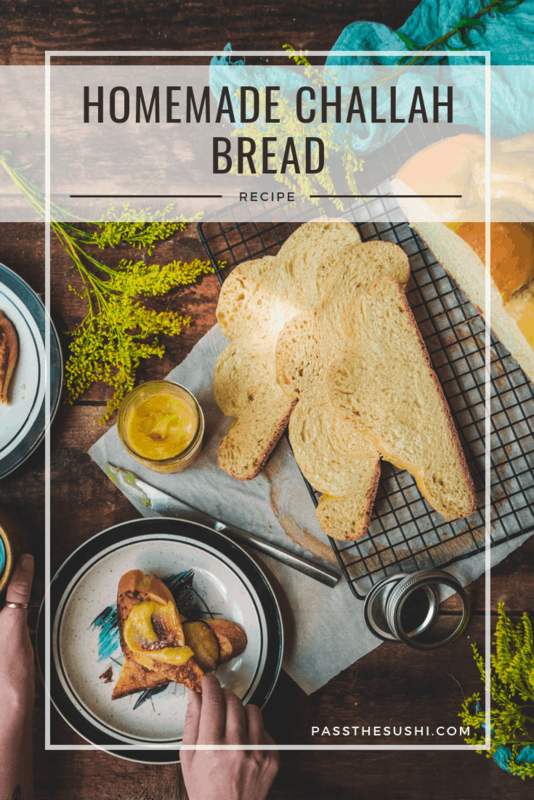 I’ve never heard of challah bread before, but I have to make it! Om nom nom. The dish is delicious. I am keeping this recipe got to try this later. Bread is one of my favorite things to eat. This recipe looks awesome. This is one of my favorite breads to make. Great for French toast too! I am so excited to have come across this post! I am very much looking forward to sharing this recipe. Oh your photos are gorgeous! This bread does sound amazing and looks like it would taste so good. Whoa! I love Challah bread! This looks so yummy and doesn’t seem so hard to do! Beautiful pictures! I think challah bread is easily the prettiest bread to photograph. Your photos are amazing, by the way. I have eaten challah but never made it myself. Glad to learn something about jewish dish here. I have very little knowledge on jewish cuisine. However I tasted one Jewish freshly made bread in Max original in California USA and Max is actually started by a Jewish owner. The bread tasted so good and unforgetable for me. I would love to try Challah out, the pictures tell me it should taste good. We love challah bread! My husband makes the most amazing French toast with challah bread! I’ve never had Challah bread before, but this looks delicious. I would love to try making this sometime. I love trying new culture food. Plus I love bread.